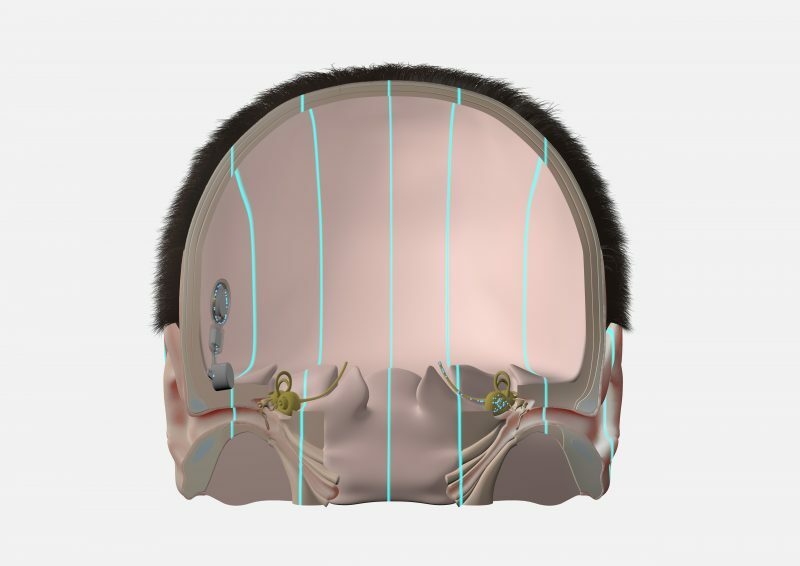 Earlier, we looked at how a cochlear implant can be an effective treatment option for sensorineural single-sided deafness. However, a cochlear implant may not be the right treatment option for a number of patients with single-sided deafness. By design, a cochlear implant requires a functional auditory nerve on the deafened side. Thankfully, there’s an effective treatment option for these candidates—a bone conduction hearing system. A bone conduction system for SSD sends sounds from the deafened side to the hearing cochlea. Today, we’re going to look at our two bone conduction hearing systems. We’ll see how BONEBRIDGE and ADHEAR can both be excellent treatment options for single-sided deafness. Let’s start with the basics of bone conduction, and how BONEBRIDGE and ADHEAR can be effective options for patients with single-sided deafness. A bone conduction system uses mechanical vibrations to send sounds from the deafened side to the hearing cochlea on the other side of the head. With BONEBRIDGE, the active bone conduction implant is placed completely under the skin on the deafened side. The SAMBA audio processor detects sounds from this side, and transmits the sounds as electronic signal to the implant. The BONEBRIDGE implant converts these electronic signals into mechanical vibrations that travel directly through the bone. The BONEBRIDGE Active Bone Conduction implant offers direct sound transmission for optimal hearing outcomes. With ADHEAR, the audio processor is attached to the skin using a simple adhesive adapter. This makes ADHEAR a non-surgical option. 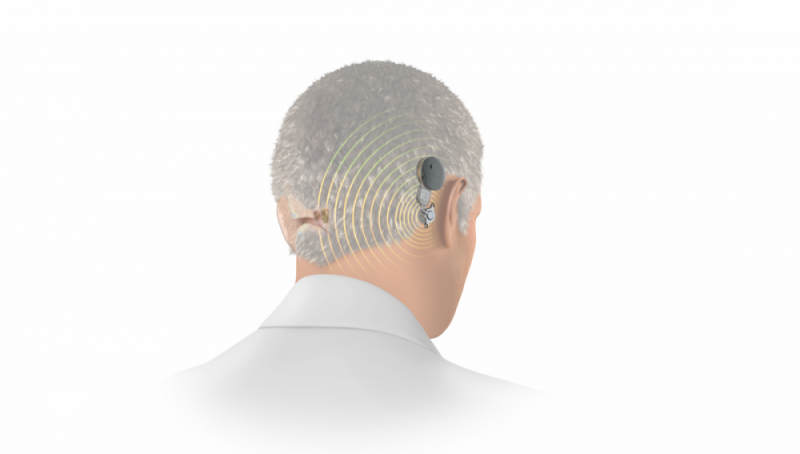 The ADHEAR audio processor transmits the vibrations through the skin to the bones of the head. 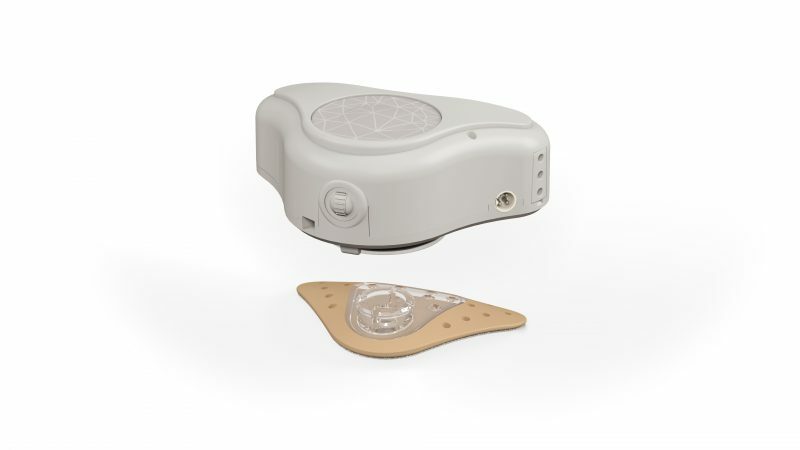 The ADHEAR audio processor and adhesive adapter offers a unique non-surgical treatment option for SSD. When used to treat single-sided deafness, the mechanical sound vibrations of BONEBRIDGE and ADHEAR travel across the bones of the head from the deafened side to the hearing cochlea. This offers a natural sound quality with only one hearing cochlea, and effectively eliminates the head shadow effect. Head shadow effect: The head is a natural barrier between the ears that muffles higher frequencies (1000 Hz and up) by as much as 20 dB when sounds arriving from the opposite side travel around the head to reach the ear. Without an implant, sounds on the deafened side are very difficult to hear. Who is a candidate for BONEBRIDGE or ADHEAR? The following guidelines can help you better understand candidacy guidelines for BONEBRIDGE and ADHEAR for your patients with single-sided deafness. 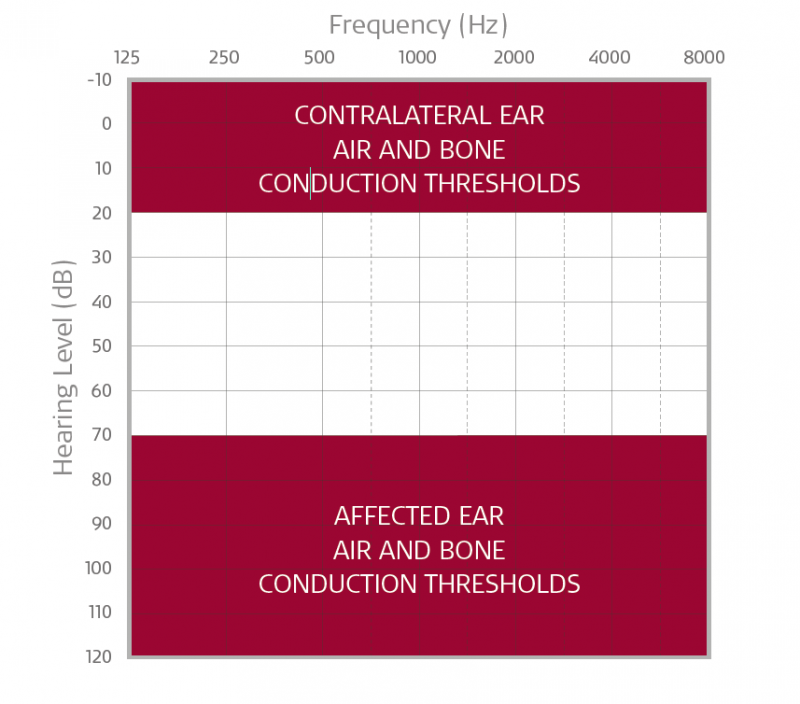 BONEBRIDGE or ADHEAR may be an ideal treatment option if your patient has severe-to-profound sensorineural hearing loss in the affected ear with hearing thresholds that fall within the shaded area in the chart above. Air & bone conduction thresholds in the contralateral ear should be 20 dB or less. When should you choose an ADHEAR, and when is a BONEBRIDGE a better option? ADHEAR is a non-surgical hearing system, so you can easily try it out to see if it is a good option for each patient. This lets your patient immediately and realistically experience the sound quality of ADHEAR. And if your patient needs greater amplification, BONEBRIDGE has the advantage of direct sound transmission and higher dynamic range for optimal hearing outcomes. What sets our BONEBRIDGE and ADHEAR systems apart from a CROS hearing aid system? 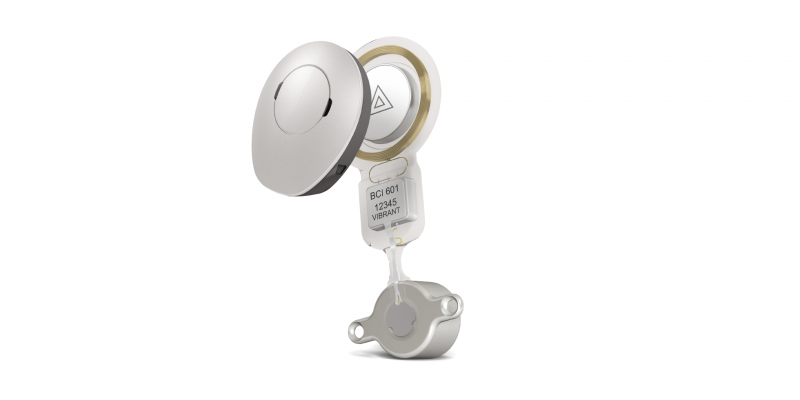 Contralateral routing of signals (CROS) hearing aids are a common first step treatment option for SSD. However, with a CROS hearing aid, your patients would need to wear a hearing aid transmitter or receiver in both ears. In contrast, both BONEBRIDGE and ADHEAR are exceptionally comfortable and are worn completely off the ear. With BONEBRIDGE, the compact SAMBA audio processor easily disappears under hair. And there’s no occlusion effect, so natural hearing is not affected. That’s why BONEBRIDGE and ADHEAR both offer clear advantages for candidates with SSD. As the only active bone conduction implant, BONEBRIDGE allows for healthy skin between the audio processor and implant. And as the only non-surgical option without uncomfortable pressure, ADHEAR also offers healthy skin and simple access to immediate hearing benefit. So, as you can see, both the BONEBRIDGE and ADHEAR bone conduction systems can offer many benefits for your patients with single-sided deafness. Want to know more about ADHEAR and BONEBRIDGE for your clinic? Contact us! Get a first-person view of procedure for implanting BONEBRIDGE: Check out this BONEBRIDGE surgical case study with Prof. Dr. Joachim Müller. Don’t forget to subscribe for the latest articles on hearing implants and hearing loss solutions! Usami, SI., Kitoh, R., Moteki, H., Nishio, S.Y., Kitano, T., Kobayashi, M., Shinagawa, J., Yokota, Y., Sugiyama, K., & Watanabe, K. (2017) Etiology of single-sided deafness and asymmetrical hearing loss. Acta Otolaryngol. 137(565):S2-S7. Wendrich, A.W., Kroese, T.E., Peters, J.P.M., Cataani, G., & Grolman, W. (2017). Systematic review on the trial period for bone conduction devices in single-sided deafness: Rates and reasons for rejection. Otol Neurotol. 38(5):632-641. Sprinzl, G.M., & Wolf-Magele, A. (2016) The Bonebridge Bone Conduction Hearing Implant: indication criteria, surgery and a systematic review of the literature. Clin Otolaryngol. 41(2):131-43. Salcher, R., Zimmermann, D., Giere, T., Lenarz, T., & Maier, H., (2017) Audiological results in SSD with an active transcutaneous bone conduction implant at a retrosigmoidal position. Otol Neurotol. 38(5):642-647.